Effortlessly ramp up your playing speed, fluidity, and accuracy, without having to spend hours and hours on boring, repetitive drills. 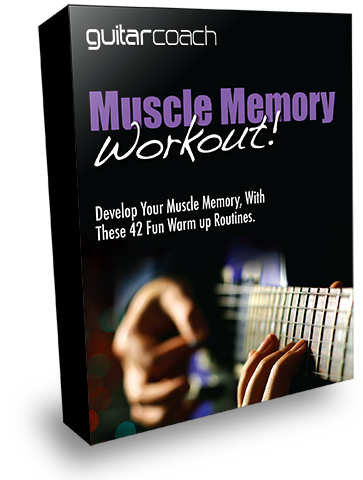 Get Instant Access to 42 Muscle Memory Workout sessions: train your fingers to work instinctively and intuitively, on an almost subconscious level. Inside this program, there’s 42 detailed video training sessions for you, which cram in every skill and trick in the book, into structured warm up and practice sessions. In these sessions, you’ll learn and develop your string bending, pull-offs, hammer-ons, slides, and double stops. You’ll develop your palm muting, string muting, and string skipping. You’ll learn different scales, and in different positions on the fretboard. You’ll develop your finger dexterity, alternate picking, speed picking, and your rhythm and timing. This will give you months, if not years, of routines, that will make your playing progress, easier and faster than ever. Each session offers a new challenge, to keep your playing fresh and motivation high. This is a digital product. Once you have completed your purchase you will automatically be redirected to the Guitar Coach Members site where you can get instant access. Getting your fingers warmed up properly before you get into learning anything new is absolutely essential. It will make your playing sessions so much more fun, and you’ll feel more comfortable and relaxed. Plus you’ll learn faster and make less mistakes! Module 4: A session combining of some of the elements of Modules 1,2 and 3 into a single routine, to test your skills, rhythm and timing. Module 5: Major chords in the open position and quick chord changing routine, plus adding in notes of the E minor pentatonic in Position 1. Module 7: E major/D major and A major chords combined with pull offs. Combining chord changing with picking to create a version of the Black is Back intro by AC/DC. Module 8: A session combining of some of the elements of Modules 5, 6 and 7 into a single routine to test your skills, rhythm and timing. Module 9: A minor pentatonic exercise, going up and down the strings. Testing your fretboard knowledge and string picking to create a bluesy B.B. King type lick. Module 10: String skipping using G minor pentatonic scale notes. Creating a typical song ending using the G minor pentatonic scale. Module 11: More string skipping with the G minor pentatonic scale, plus double stops, to create the intro to My Sharona by The Knack. Module 12: A session combining of some of the elements of Modules 9, 10 and 11 into a single routine to test your skills, rhythm and timing. Module 13: E minor pentatonic speed lick. Right-hand pick speed and pull-offs to create the lick from Rain by Status Quo. Focus on right-hand pick speed, pull-offs and fretting. Module 14: B minor pentatonic speed lick, using right-hand pick speed to create the end of Beat It Riff by Michael Jackson. Module 15: D minor pentatonic speed riff, combining finger speed, hammer-ons and pull-offs, to create Sultans of Swing solo. Focus on pick speed, fretting and pull-offs. Module 16: A session combining of some of the elements of Modules 13, 14 and 15 into a single routine to test your skills, rhythm and timing. Module 17: String bending exercise – bending each of the top 3 strings up 2 steps. This session’s focus is on string bending, fretting and vibrato to create a neat little riff. Module 18: More string bending taking each of the top 3 strings up 1 step i.e. one semi-tone. Then creating a riff applying string bending techniques going up a semitone, plus vibrato. Module 19: Focuses on string bending and release, pick speed and control, to create a variation of Still Got The Blues intro by Gary Moore. Emphasis on string bending and release, accuracy and slides. Module 20: A session combining of some of the elements of Modules 17, 18 and 19 into a single routine to test your skills, rhythm and timing. Module 21: Pull-off on the G string using open and fretted notes in the G major scale. Focus on speed, pull-offs and fretting accuracy. Module 22: Descending notes utilising the top E string. Focus on hammer-ons, pull-offs and speed. A melodic riff using the top E string for open and fretted pull-offs. Module 23: String bending, hammer-ons, pull-offs, speed and timing. A speed riff using the open top E string and frets 12, 15, 17 and 19. Module 24: A session combining of some of the elements of Modules 20, 21 and 22 into a single routine, to test your skills, rhythm and timing. Your purchase today is covered By our full, No-Risk, 30 Day Money Back Guarantee. Your payment today is only $7. But if you’re not 100% satisfied with your purchase, please request a refund. Just click the "Help?" tab, which is on every page of our site. You do not need to give us a reason. It’s simple, easy and instant. 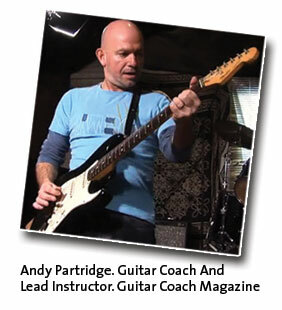 As a well respected player, teacher and coach, Andy Partridge is the lead instructor within the Guitar Coach Academy. 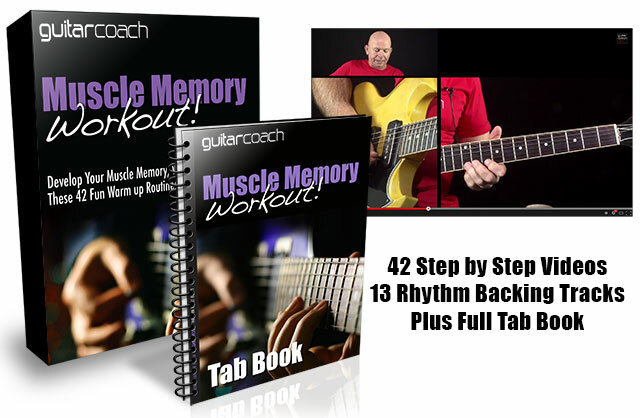 Andy’s gentle step by step approach and detailed note by note lessons, will give you the confidence, reassurance and motivation you need, to really achieve your guitar playing goals sooner than you thought possible. His relaxed and engaging teaching style (complete with sometimes questionable jokes) make learning easier, faster, and so much more fun.